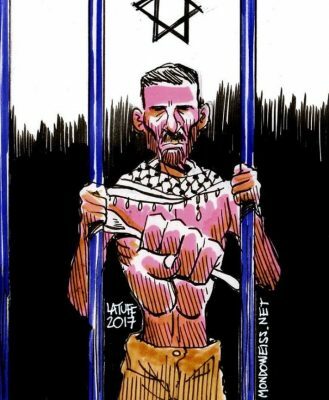 The Prisoners and Ex-Prisoners’ Affairs Committee confirmed, on Sunday, that despite deteriorating health, three Palestinian detainees continue their open hunger strike, in pursuit of their demands. The committee reported, according to Ma’an News Agency, that Palestinian detainee Jamal al-Qam, 48, from the southern occupied West Bank city of Bethlehem, who is currently held in the Ofer detention center, underwent 19 days of open hunger strike and will continue with his strike. Detainee Sheikh Khader Adnan, 40, from the northern West Bank district of Jenin, who is currently being held in the Israeli Raymond prison, started an open hunger strike 15 days ago, and confirmed his continuation, refusing the legitimacy of his arbitrary detention. Meanwhile, Imran al-Khatib, 60, from the southern besieged Gaza Strip, continues his hunger strike for the 43rd consecutive day, demanding early release from Israeli detention.